Effective 1 August 2012, Dr. John D. Petersen is the new IUPAC Executive Director. Petersen succeeds Dr. Terrence A. Renner who has elected to retire at the end of this year. Petersen comes to IUPAC from the neighboring Research Triangle Institute in North Carolina, where he was vice president of University Collaborations, Development, and Outreach. He obtained his Bachelor of Science degree in Chemistry from California State University, Los Angeles. Thereafter, he completed his Ph.D. in inorganic chemistry at the University of California, Santa Barbara, as a student of Prof. Peter C. Ford. Petersen’s distinguished career includes positions as executive director of the RTP Solar Fuels Project, president of the University of Tennessee System, and academic appointments at the University of Connecticut, Wayne State University, Kansas State University, and Clemson University. 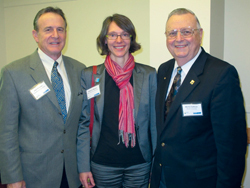 John Petersen (left), IUPAC Executive Director, Fabienne Meyers (center), IUPAC Associate Director, and Morton Hoffman, IUPAC member and U.S. representative on the Committee on Chemistry Education, at the ACS Northeastern Section event held on 11 October 2012 at Nova Biomedical Corp. in Waltham, Massachusetts, USA.